Igbo, Harriet Uche (CLN) is Librarian I in the Nnamdi Azikiwe Library, University of Nigeria, Nsukka. 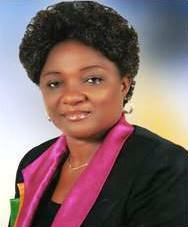 She holds Masters Degrees in Education (2000) and Library and Information Science (2008) in addition to a Bachelors Degree in Education (1994) and Diploma in Social Work (1988) all of the University of Nigeria, Nsukka. Presently, she is a doctoral student in the Department of Library and Information Science of the University of Nigeria, Nsukka. Mrs. Igbo is the Assistant Circulation Librarian in the Public Services Division of the Nnamdi Azikiwe Library. Her duty schedules, among others, include assisting the Circulation Librarian in all the processes involved in library circulation work, coordination of general shelving supervision, coordination of IT program, supervision/assessment of Library and Information Science intern students in Circulation Section and coordination of user registration. A Research Consultant to the Department of Veterinary Physiology and Pharmacology, University of Nigeria, Nsukka, who also lectures in the Use of the Library and Study Skills (GSP111) Course for undergraduate students of the University. She has attended several conferences at the state, national and international levels with papers presented. She has published several journal articles and some chapters in books in the field of Librarianship. Main research interest includes user studies, information literacy and digital libraries. Skillful in the application of technology to information service delivery and indexing processes, especially back-of the-book indexing. Use of the library and study skills.